A rose is a flowering shrub of the genus Rosa, and the flower of this shrub. There are more than a hundred species of wild roses, all from the northern hemisphere and mostly from temperate regions. The species form a group of generally thorny shrubs or climbers, and sometimes trailing plants, reaching 2–5 m tall, rarely reaching as high as 20 m by climbing over other plants. Roses thrive in temperate climates, though certain species and cultivars can flourish in sub-tropical and even tropical climates, especially when grafted onto appropriate root-stock. Many thousands of rose hybrids and cultivars have been bred and selected for garden use, mostly double-flowered with many or all of the stamens mutated into additional petals. Twentieth-century rose breeders generally emphasized size and color, producing large, attractive blooms with little or no scent. Many wild and "old-fashioned" roses, by contrast, have a strong sweet scent. A few cultivars, such as the Lady Banks rose have been selected for having no thorns. Rose hips are sometimes eaten, mainly for their vitamin C content. They are usually pressed and filtered to make rose-hip syrup, as the fine hairs surrounding the seeds are unpleasant to eat (resembling itching powder). They can also be used to make herbal tea, jam, jelly and marmalade. Wild Roses - The wild roses includes the species listed above and some of their hybrids. Alba - Literally "white roses", derived from R. arvensis and the closely allied R. alba. These are some of the oldest garden roses, probably brought to Britain by the Romans. Once-flowering. Examples: 'Semi-plena', 'White Rose of York'. Gallica - The Gallica roses have been developed from R. gallica which is a native of central and southern Europe. They flower once in the summer. Examples: 'Cardinal de Richelieu', 'Charles de Mills', 'Rosa Mundi' (R. gallica versicolor). Damask - Robert de Brie is given credit for bringing them from Persia to Europe sometime between 1254 and 1276. Summer Damasks (crosses between Gallica roses and R. phoenicea) bloom once in summer. Autumn Damasks (Gallicas crossed with R. moschata) bloom later, in the autumn. Examples: 'Ispahan', 'Madame Hardy'. Centifolia (or Provence) - These roses, raised in the seventeenth century in the Netherlands, are named for their "one hundred" petals. Once-flowering. Examples: 'Centifolia', 'Paul Ricault'. Moss - Closely related to the centifolias, these have a mossy excrescence on the stems and sepals. Once-flowering. Example: 'Comtesse de Murinais', 'Old Pink Moss'. China - The China roses brought with them an amazing ability to bloom repeatedly throughout the summer and into late autumn. Four china roses ('Slater's Crimson China', 1792; 'Parsons' Pink China', 1793; 'Hume's Blush China', 1809; and 'Parks' Yellow Tea Scented China', 1824) were brought to Europe in the late eighteenth and nineteenth centuries which brought about the creation of the repeat flowering old garden roses and later the modern garden roses. Examples: 'Old Blush China', 'Mutabilis'. Portland - These are named after the Duchess of Portland who received (from Italy in 1800) a rose then known as R. paestana or 'Scarlet Four Seasons' Rose' (now known simply as 'The Portland Rose'). This group was developed from that rose. Repeat-flowering. Example: 'James Veitch', 'Rose de Rescht', 'The Portland Rose'. Bourbon - They originated on l'Île de Bourbon (now called Réunion). Probably the result of a cross between the Autumn Damask and the 'Old Blush China'. Introduced in France in 1823. Repeat-flowering. Examples: 'Louise Odier', 'Mme. Pierre Oger', 'Zéphirine Drouhin'. Hybrid Perpetual - The dominant class of roses in Victorian England, they were derived to a great extent from the Bourbons. Repeat-flowering. Examples: 'Ferdinand Pichard', 'Reine Des Violettes'. Tea - The result of crossing two of the original China Roses ('Hume's Blush China' and 'Parks' Yellow Tea Scented China') with various Bourbons and Noisette roses. Somewhat more tender than other old garden roses (most likely because of R. gigantea in the ancestry of the Parks rose), teas are repeat-flowering roses although their fragrance is not always a tea scent. Example: 'Lady Hillingdon'. Bermuda "Mystery" Roses - A group of several dozen "found" roses that have been grown in Bermuda for at least a century. The roses have significant value and interest for those growing roses in tropical and semi-tropical regions, since they are highly resistant to both nematode damage and the fungal diseases that plague rose culture in hot, humid areas, and capable of blooming in hot and humid weather. Most of these roses are likely Old Garden Rose cultivars that have otherwise dropped out of cultivation, or sports thereof. They are "mystery roses" because their "proper" historical names have been lost. Tradition dictates that they are named after the owner of the garden where they were rediscovered. Miscellaneous - There are also a few smaller classes (such as Scots, Sweet Brier) and some climbing classes of old roses (including Ayrshire, Climbing China, Laevigata, Sempervirens, Noisette, Boursault, Climbing Tea, and Climbing Bourbon). Those classes with both climbing and shrub forms are often grouped together. Hybrid Tea - The favourite florist's rose, with typically one to at most five or six large flowers per stem, the flower with numerous tightly arranged petals with reflexed tips (see photo, right). They are favoured in small gardens in formal situations, and for buttonhole roses. Floribunda - Flowers often smaller, in large clusters of ten or more (often many more) on each stem. These tend to give a more prominent display from a distance, so are more often used in large bedding schemes in public parks and similar spaces. Buck Roses - Griffith Buck, professor of horticulture at Iowa State University from 1948 to 1985, hybridized nearly 90 rose varieties. Buck roses are known for disease resistance and winter hardiness. Roses are one of the most popular garden shrubs and are also among the most common flowers sold by florists. Roses are of great economic importance both as a crop for florists' use and for use in perfume. Rose perfumes are made from attar of roses or rose oil, which is a mixture of volatile essential oils obtained by steam-distilling the crushed petals of roses. The technique originated in Persia (the word Rose itself is from Persian) then spread through Arabia and India, but nowadays about 70% to 80% of production is in the Rose Valley near Kazanluk in Bulgaria, with some production in Qamsar in Iran and Germany. The Kaaba in Mecca is annually washed by the Iranian rose water from Qamsar. In Bulgaria, Iran and Germany, damask roses (Rosa damascena 'Trigintipetala') are used. 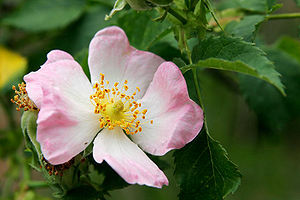 In the French rose oil industry Rosa centifolia is used. The oil, pale yellow or yellow-grey in color, is sometimes called 'Rose Absolute' oil to distinguish it from diluted versions. The weight of oil extracted is about one three-thousandth to one six-thousandth of the weight of the flowers - for example, about 2,000 flowers are required to produce one gramme of oil. Britton, Nathaniel Lord; Addison Brown (1913). An Illustrated Flora of the Northern United States and Canada, Volume 2 (second edition ed.). Dover Publications, inc.. pp. 282-286. Ann Fowler Rhoads and Timothy A. Block (2000). The Plants of Pennsylvania: An Illustrated Manual. Anna Anisko, illustrator. Morris Arboretum, University of Pennsylvania Press. pp. 618-621. P. D. Strausbaugh and Earl L. Core (1977). Flora of West Virginia (Second ed.). Seneca Books, Grantsville, W. Virginia. pp. 530-534. Christopher Brickell and Judith D. Zuk (1997). The American Horticultural Society A-Z Encyclopedia of Garden Plants. DK Publishing. pp. 888-913. Staff of the L. H. Bailey Hortorium (1976). Hortus Third: A Concise Dictionary of Plants Cultivated in the United States and Canada. Cornell University Press. pp. 974-978. Pirone, Pascal P. (1978). Diseases & Pests of Ornamental Plants (Fifth Edition ed.). John Wiley & Sons, New York. pp. 462-474. Cranshaw, Whitney (2004). Garden Insects of North America: The Ultimate Guide to Backyard Bugs. Princeton University Press. pp. 618. Pippa Greenwood, Andrew Halstead, A.R. Chase, Daniel Gilrein (2000). American Horticultural Society Pests & Diseases: The Complete Guide to Preventing, Identifying, and Treating Plant Problems (First Edition ed.). Dorling Kindersley (DK) Publishing, inc.. pp. 197. This page was last edited on 29 October 2017, at 03:29.